EXCLUSIVE Your design style is the picture of elegance and sophistication, making our graceful new arrangement a natural fit. 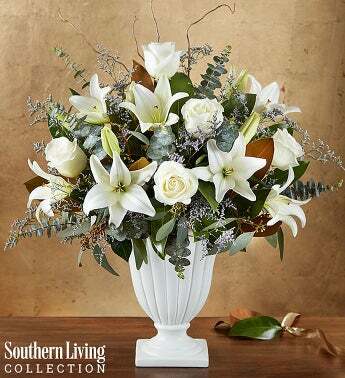 Brought to you exclusively through our partnership with Southern Living®, this statement-making design boasts an abundance of striking white blooms, lush greenery and charming natural accents, all gathered by hand into our exquisite pedestal vase. With its unique texture and inviting fragrance, this is one gift they won’t soon forget. Celebrating the best life in the South, Southern Living® shares authentic experiences and their love of florals in an exclusive new partnership with 1-800-Flowers.com. We’ve captured that spirit by creating arrangements and one-of-a-kind gifts that deliver beauty and Southern charm.